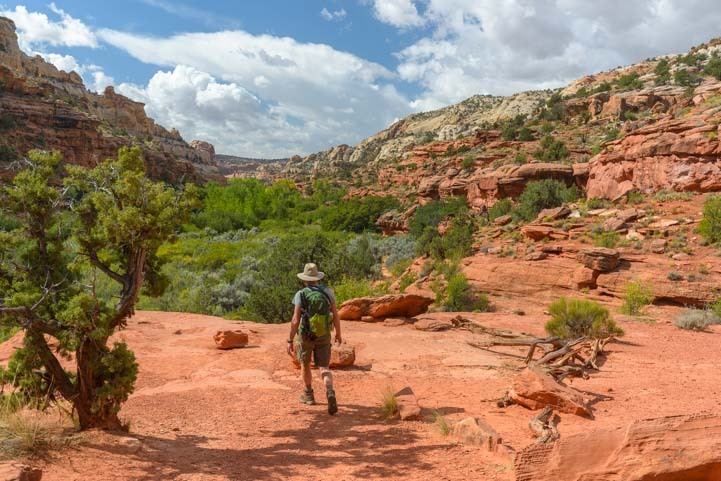 September 2016 – Scenic Byway 12 in Utah is an All American Road that makes for a truly spectacular RV adventure. 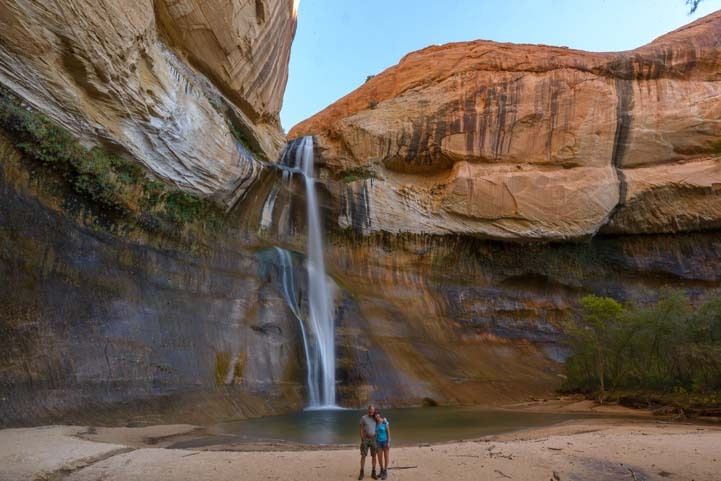 There are lots of sidetrips and things to do along the way, and one that we just loved was the hike to Lower Calf Creek Falls in Grand Staircase Escalante National Monument. 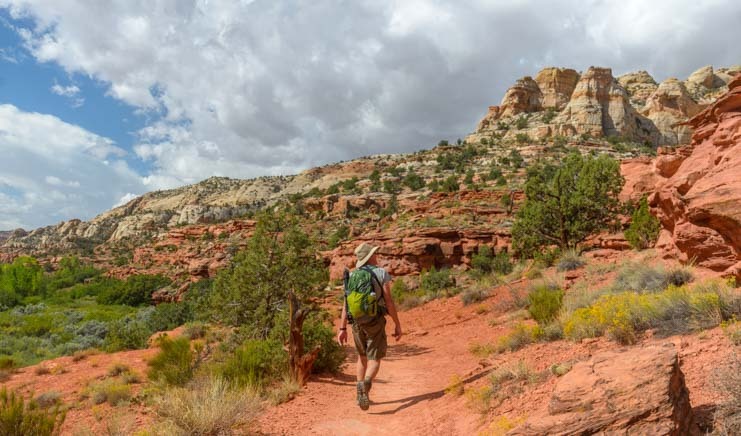 This is an easy 6 mile roundtrip hike that can be very hot at midday, so we started just as the trail was beginning to get light enough to see. We began our hike very early. 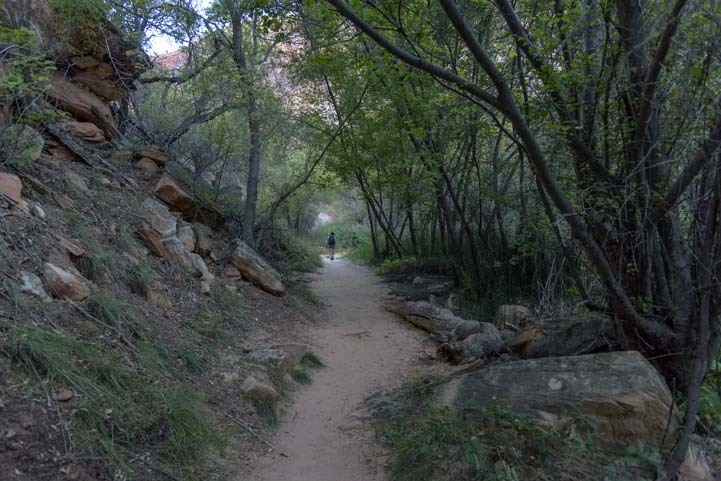 The Lower Calf Creek Falls Trail goes along Calf Creek. 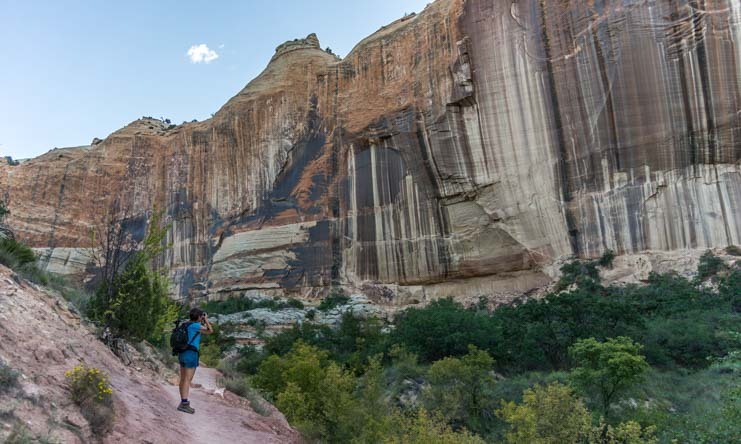 After passing through areas where very thick and tall underbrush not only surrounded us but rose above us on all sides, the trail emerged alongside a fabulous rock wall that was naturally striped with desert varnish. 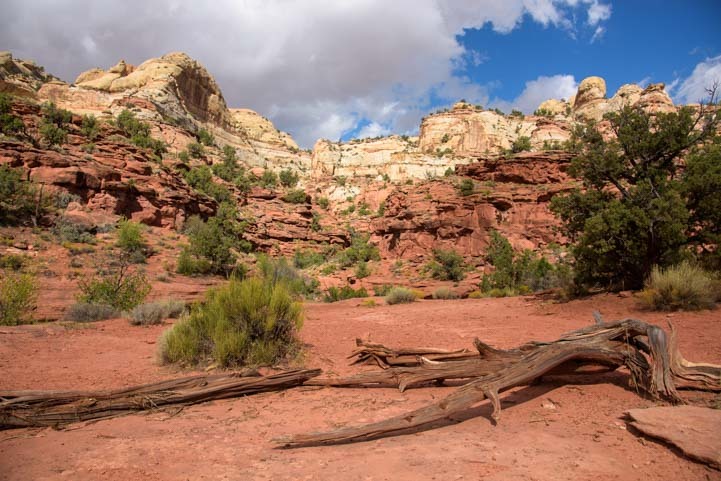 Gradually, in places, the sun began to rise, and we found ourselves amid beautiful red rock formations. The trail cut across open grasslands. 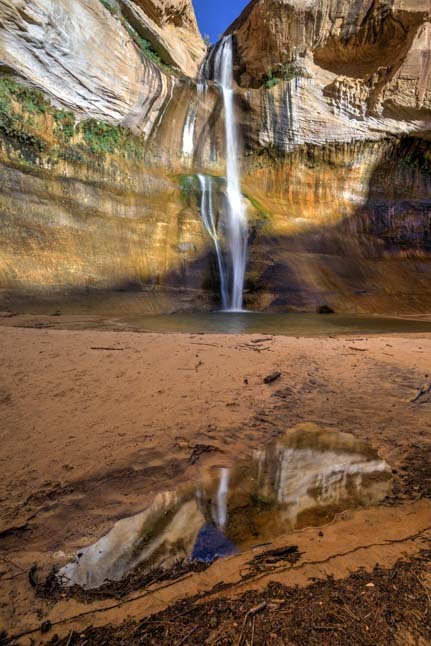 Sun and shadow on Lower Calf Creek Falls. And then it wandered across wide flat expanses of red rocks. 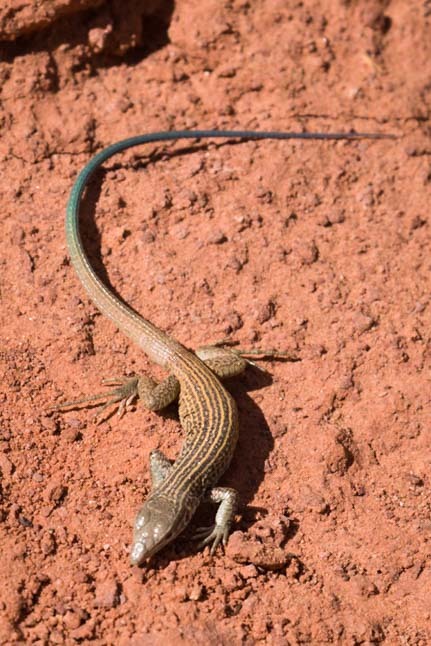 Birds were singing in the underbrush down by the creek, and at our feet we saw little lizards scurrying around. 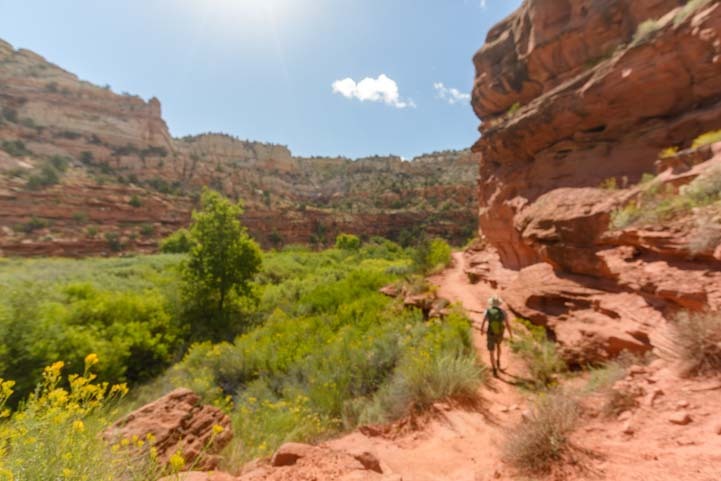 The canyon walls surrounding Calf Creek towered above us, and a lush valley of thick green vegetation grew along the banks of the creek. 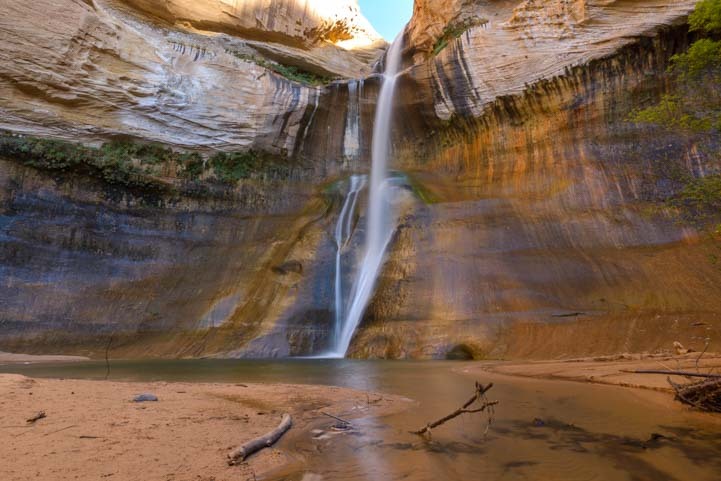 Finally, after three miles of walking, we emerged at Lower Calf Creek Falls. 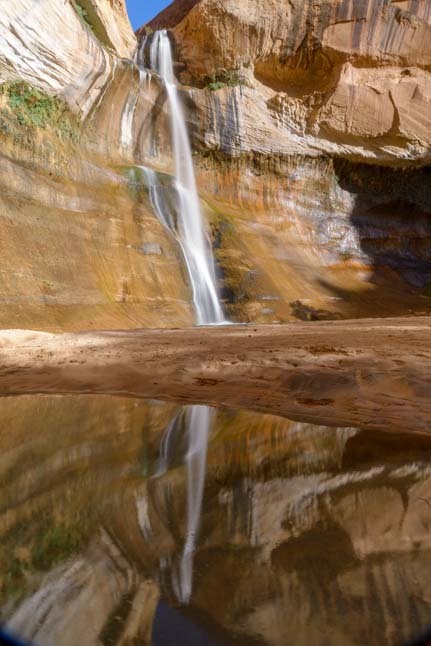 Lower Calf Creek Falls, Grand Staircase Escalante National Monument. 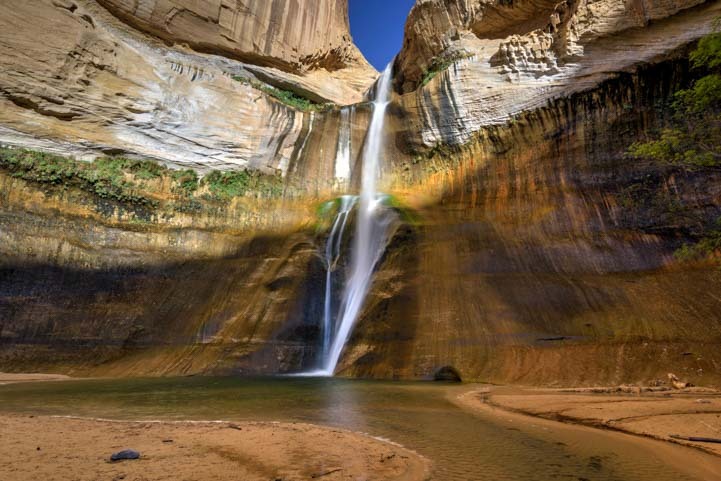 This is a fabulous waterfall that plunges straight down from a notch in the cliffs above, forming a narrow vertical stream of water. 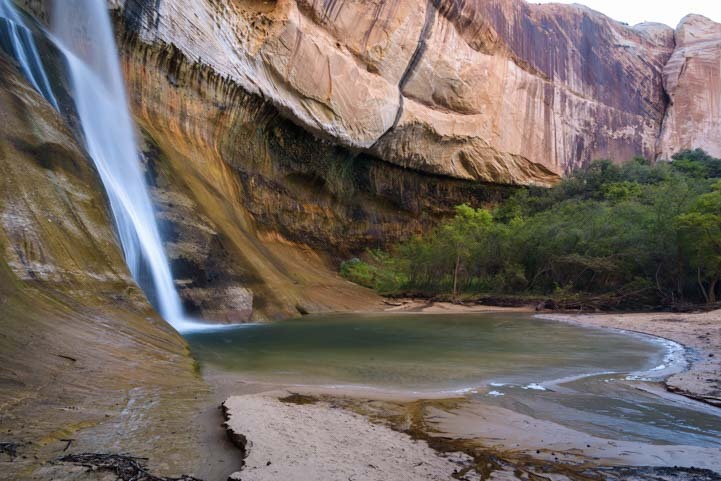 Hustling out on the trail before sunrise had ensured that when we got to Calf Creek Falls we were the only people there. The waterfall plunges into a pool at its base. So we did the thing you just have to do in scenic places these days and we got a selfie! 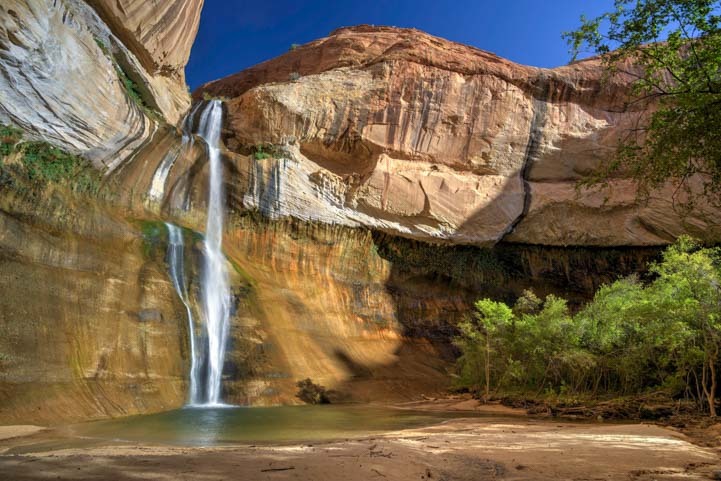 Towering canyon walls and their waterfall embrace us on the sandy beach. 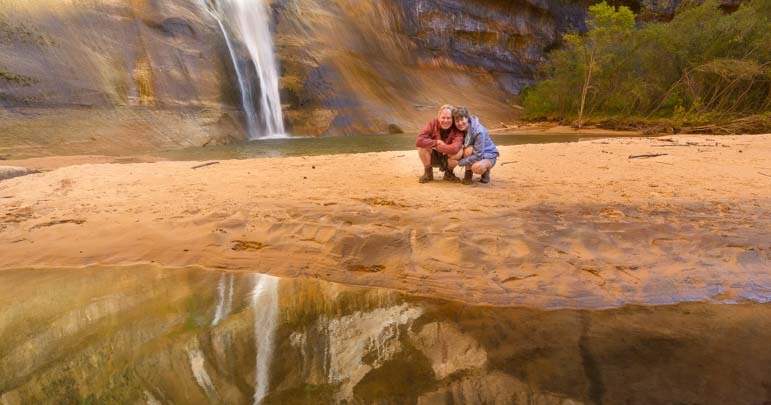 How fabulous it was to have the entire place to ourselves and to be able to play with the waterfall’s reflections in pools and puddles along the sandy beach. Gradually, the sun rose higher in the sky, lighting the upper parts of waterfall and the rocky walls. And then bright sunshine lit up the entire waterfall and we stepped back into the shadows of the natural arch formed by trees over the creek downstream. 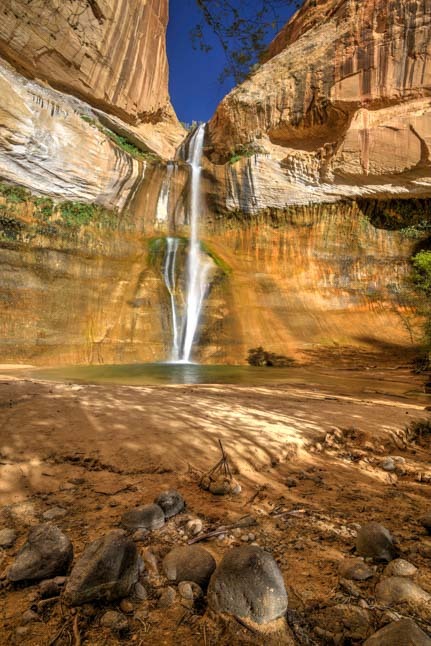 As the sun shone brighter and brighter, gradually illuminating the trees that seemed to be kneeling in reverence at the base of this magnificent waterfall, hikers began to trickle in from the trail. What an incredible view greeted them! Eventually, we were ready to hike back out again, and we began to traverse the slabs of red rocks. And we were joined on the trail by lots of other hikers. And others looked out across the lush creek valley at the enormous cliffs on the other side. 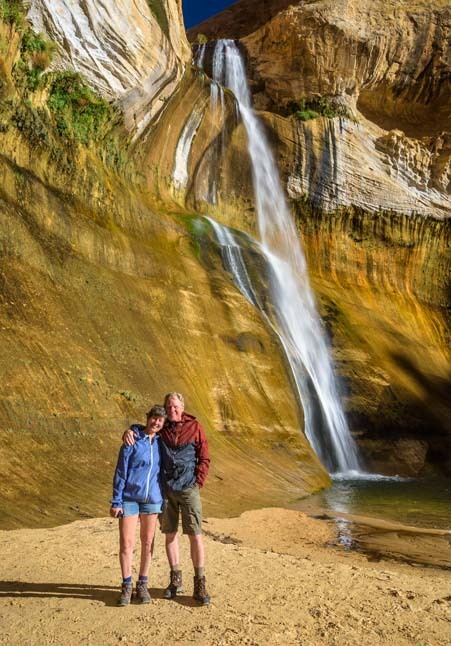 For RVers that have an RV with a strong engine, an RV trip on Utah’s Scenic Byway 12 is an absolute must, along with a hike to Lower Calf Creek Falls. 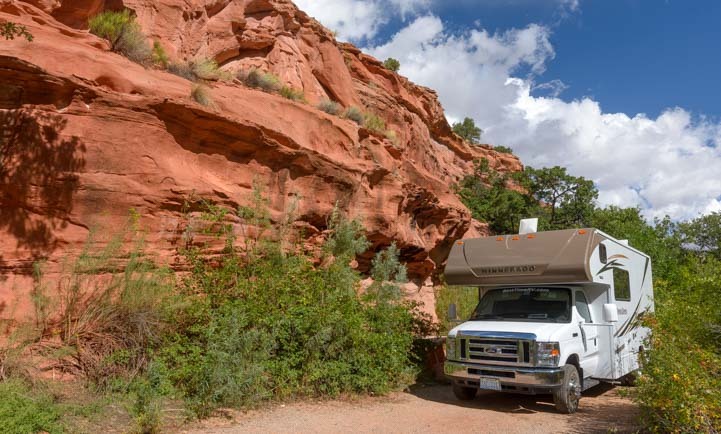 Calf Creek campground has some very cool campsites in the red rocks. 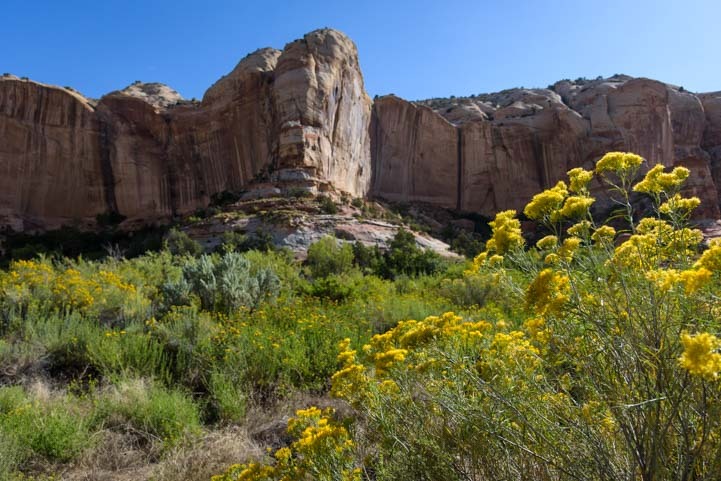 The BLM’s Calf Creek Campground is a fabulous place to camp for small and medium sized RVs. 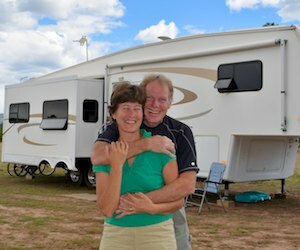 Bigger RVs can find a nice spot to stay in RV parks that are in the towns along the way. There are links below. 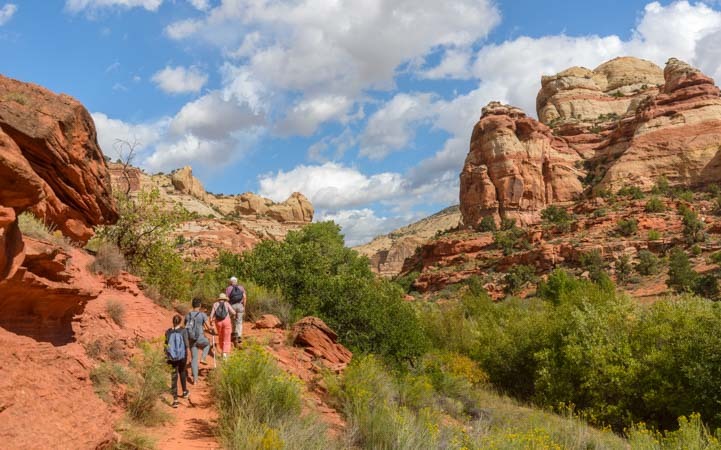 This entry was posted in Utah and tagged Exotic Landscapes, Hiking Red Rocks, New, Travel, USA, Utah, Utah Scenic Byway 12, Utah Southern, Utah Southwest, Waterfalls, WP Travel by Roads Less Traveled. Bookmark the permalink. 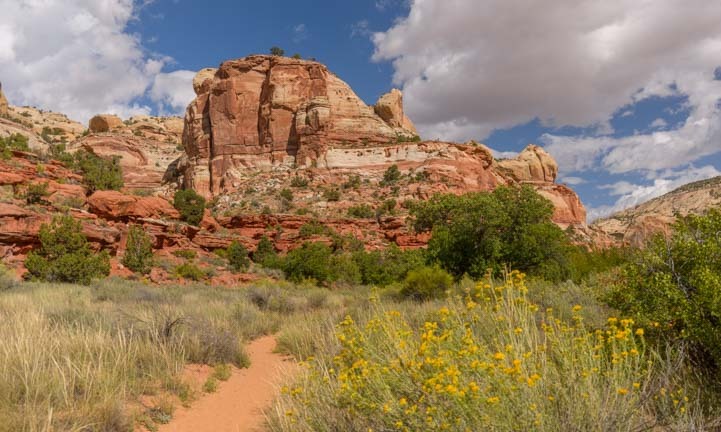 More great photos and as we move into cold weather up here in the Northeast, I love those red rock photos of pure warmth! It’s also good to see that Mark is carrying the equipment! Definitely want to put this one on my To Do list. Beautiful photography BTW. 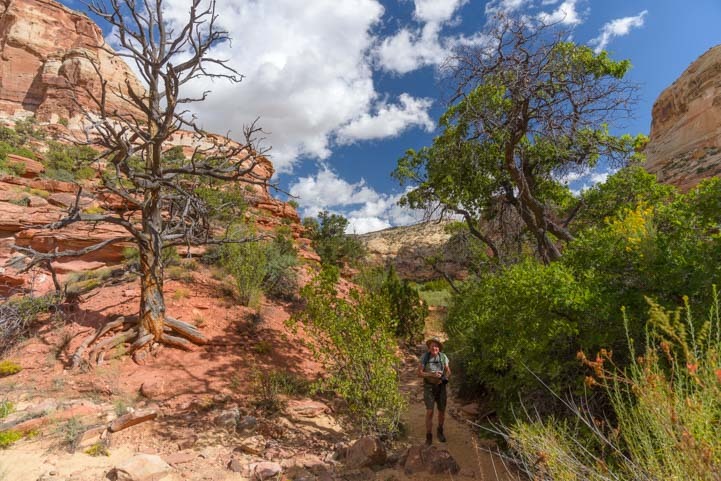 We’ve been traveling for a few years now and the hike to Lower Calf Creek still stands out as a highlight. Wish we could have captured it in photographs as beautifully as you did! 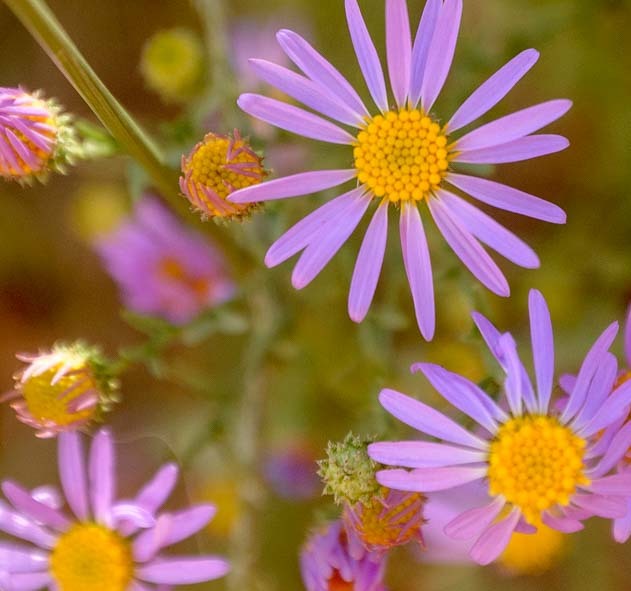 Thanks for sharing your gorgeous shots.